If you're after a unique-looking case with tempered glass and RGB lighting and Thermaltake's View 37 is either a little too pricey or didn't float your boat, then the company has plenty else to choose from in its View range of glass-class cases. The View 32 retails for around £140 or less if you shop around, yet still has four tempered glass panels and a trio of 120mm RGB fans out of the box. 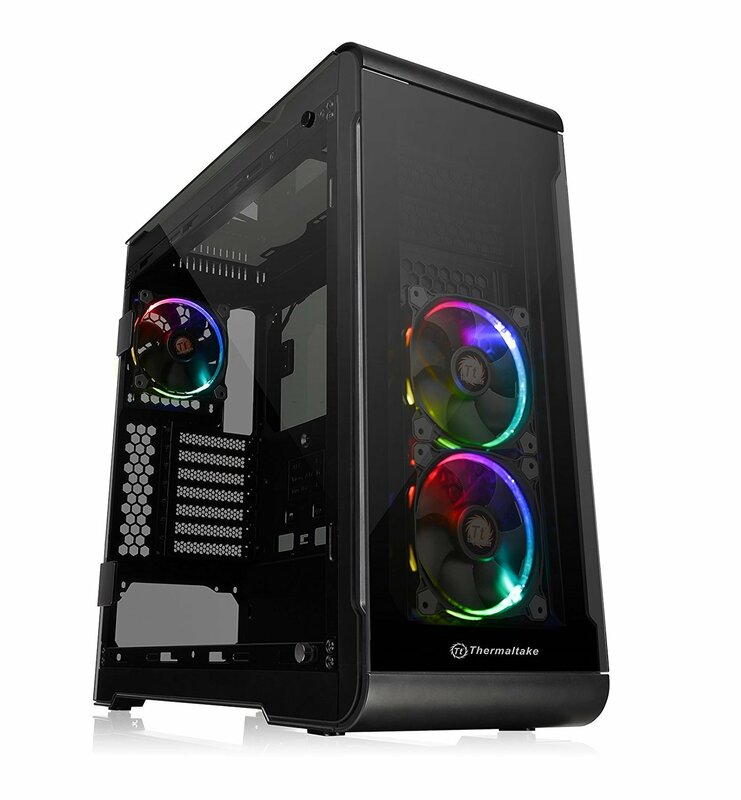 Rather than just slap glass panels onto the case, Thermaltake has taken time to merge them into the design with curved-edge sections of plastic sitting in the corners giving the illusion of a single sweeping exterior. However, the panels are still easily removable allowing you to get at the fan mounts beneath. The tinted glass allows the RGB lighting to shine through without becoming garish and rather than having dozens of thumb screws to deal with to remove the glass side panels, instead they hinge at the rear with just two thumb screws per panel to deal with. These were also packaged separately and well protected in the box, which was a nice touch. The front panel includes the RGB lighting controller, which allows you to flit between lighting modes and colours as well as switch off the lighting entirely on the three Riing RGB fans. However, it's not quite as elaborate as the controller included with the View 37. The fans have single proprietary cables that connect straight to the controller - great for cutting cable clutter, but while this allows you to control the lighting, there's no way to control fan speed as a single SATA connector powers the fans and lighting. Thankfully, noise isn't an issue as the fans are inaudible more than a few feet away, but if you were planning on hooking them up to your motherboard and controlling them that way, you'll be disappointed. Apart from this, you also get two USB 3.0 and two USB 2.0 ports plus the usual audio mini jacks. The PSU is protected from dust thanks to a removable filter in the base, but there are no filters in the roof or, more importantly, in the front of the case. The former can be solved by sticking to positive air pressure to blow out of the roof vent rather than draw air in, but the filter-less front section means you'll need to keep an eye on dust build-up inside the case. We've spotted a few cases like this recently so Thermaltake isn't alone, but we consider dust filters to be essential items on main intake vents, especially on cases costing upwards of £100. If you want your PC to be centre of attention, Thermaltake's enormous Core P90 will dominate any room, but is it any good?